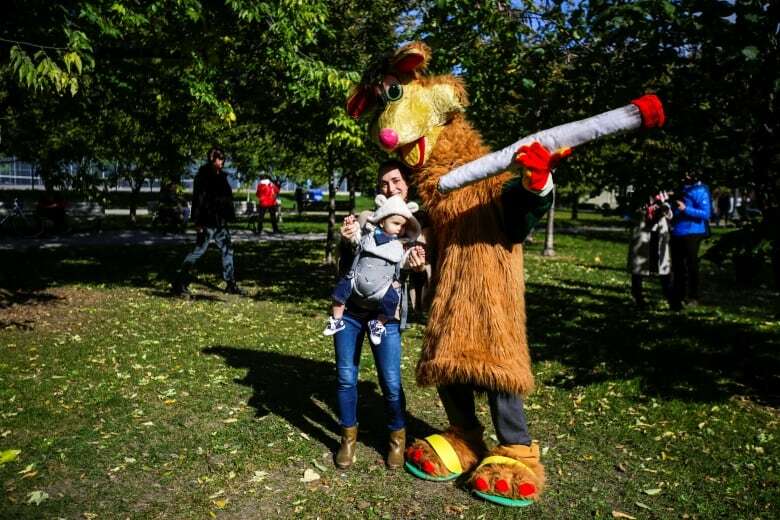 If you were out celebrating cannabis legalization in Toronto on Wednesday, you may have seen a giant kangaroo with bloodshot eyes and a massive joint posing for photos with revellers. That's Tokaroo, a weed-themed parody of the popular Canadian children's character Polkaroo from The Polka Dot Door, a TV program that aired on TVO between 1971 and 1993. 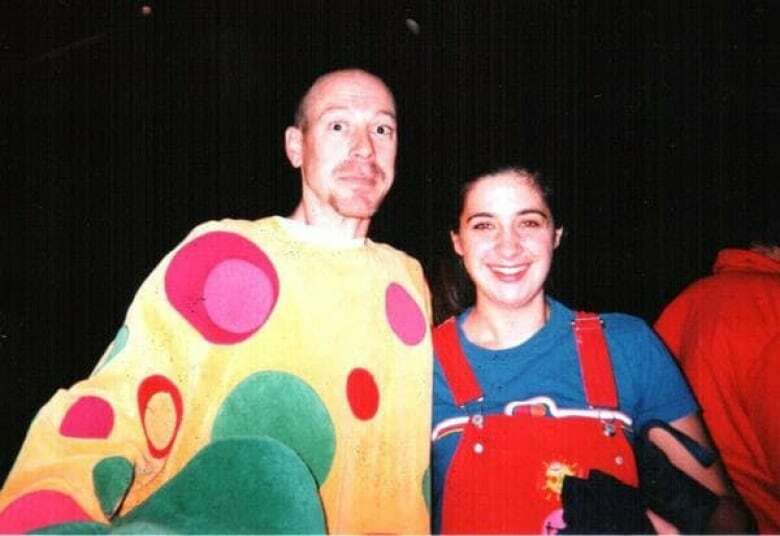 And the man in the Tokaroo costume is none other than Mark Scott — the performer who embodied Polkaroo for 22 years during promotional events. On TV, Polkaroo was played intermittently by the show's various hosts. "Tokaroo ... is a character who will talk about responsible drug use," Scott told As It Happens host Carol Off. "Now that Canada has legalized cannabis for recreational use, there can be more discussion about responsible altered states." Tokaroo is one of several Polkaroo-inspired characters Scott has created since he stopped playing the famous polka-dot kangaroo during promotional events in the '90s. 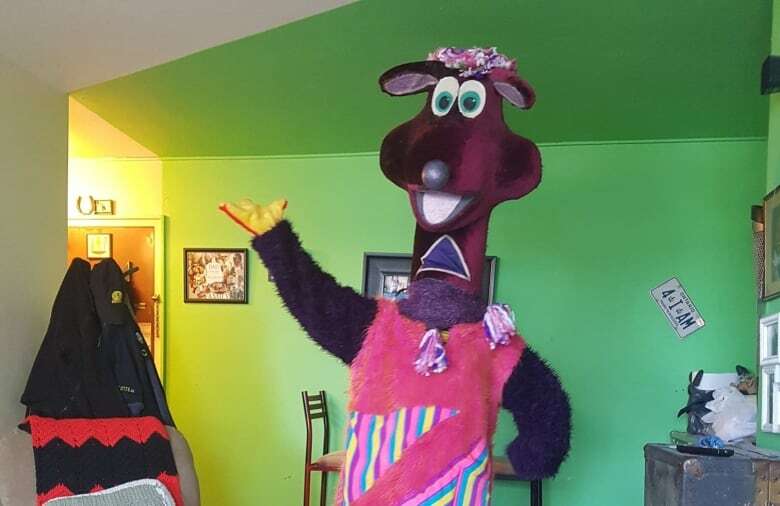 Rainbowroo discusses LGBTQ issues, Signaroo is deaf and uses sign language, and Readyroo has special needs and a "ready, willing and able attitude," Scott said. He said the characters are aimed at kids and young adults and discuss "serious issues that need to be addressed in a controversial way that's not really appropriate for mainstream media." Tokaroo, Scott assures, never made any appearances while Polkaroo was still on the air. "I think that would have been illegal," he said with a chuckle. Scott admits the folks at TVO have been "less than enthusiastic" about his unconventional creation. Tokaroo is a purely personal project and not, in any way, affiliated with the Ontario public broadcaster. "The giant spliff, as it were, is probably the symbol that lets people know that it's Tokaroo and not Polkaroo," Scott said. "Because it is a parody on Polkaroo, I often would get people saying Polkaroo and I'd have to point to that joint and say, 'No, it is Tokaroo.'" TVO told As It Happens it plans to ask Scott "to take appropriate action to stop the use of this character." "While we can understand the nostalgia, TVO does not endorse this parody of Polkaroo, or that fact that it is being associated with an activity that is neither legal for children nor recommended for use by children," TVO said in an emailed statement. Scott has nothing but fond memories of his time sporting the iconic Polkaroo costume as a TVO contractor. He said he got to meet, Queen Elizabeth, former U.S. national security adviser Colin Powell, and Saturday Night at the Movies host Elwy Yost, among others. "I got to be part of that," he said. Though he didn't get much a chance to communicate about social issues back then. Polkaroo was more of a mumbler. "When I was told to talk, I was given the instruction to be kind of like Julia Childs and Kermit the Frog," he said. For Scott, cannabis advocacy is important because pot offers an alternative to booze. "I come from an alcoholic family, and I suppose I have to admit that I sometimes want an altered state of mind too," he said. "I use the analogy that we all go to the playground to play and some go on the swings, some go on the merry-go-round, some go on the slide. "As adults, we may want an altered state of mind, and Tokaroo is there to talk about how to have that responsibly — because excess makes a mess." For stories about how cannabis legalization will affect our lives, read stories from CBC Radio and articles from CBC News.